FIGURE 4-14B Structure of aquaporins. Asterisk indicates the site of cysteine in aquaporin (AQP), AQP-CHIP and AQP-CD (collecting duct). AQP-CD is a VP-responsive aquaporin. The cysteine is not present in MIWC or AQP3. Reproduced with permission from Knepper (1994). 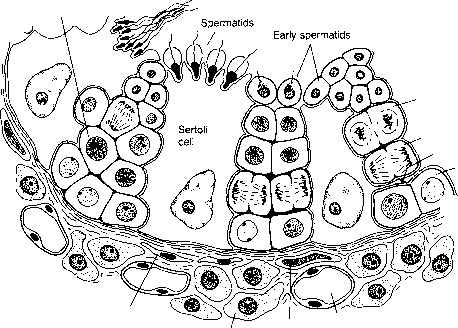 inserted into the membrane under the influence of the hormone. The VP receptor has been studied extensively in beef renal medullary membrane preparations, which contain the receptor and the coupled hormonesensitive adenylate cyclase. Isolated membrane particles retain nearly all of the specificity of binding and the affinity of the receptor for VP characteristic of the whole cell, enabling the evaluation of ligand binding and consequences for adenylate cyclase activity. In essence, the system can be summarized as shown in Figure 4-16. The binding of the hormone to the membrane receptor results in the activation of adenylate cyclase, so that the intracellular level of cyclic AMP can be raised effectively. The rate-limiting step in the activation of adenylate cyclase is the formation of the hormone-receptor complex. As in other hormone-receptor systems, there appears to be one ligand-binding site per receptor molecule. The transducing action coupling ligand interaction with receptor to activation of adenylate cyclase is a linear function. VP associates with its receptor about 30 times faster than does OT, and the receptor has about 100 times the affinity for VP compared to OT. 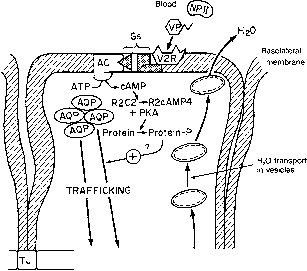 FIGURE 4-15 Speculative model of the mode of action of vasopressin via the V2 receptor in the collecting duct of the kidney (distal tubule). Starting at the top of the figure, VP is seen in its dissociated form from neurophysin II, and free VP binds to the V2 receptor. The hormone-receptor complex transmits its signal through the G-protein (Gs)-coupled receptor to adenylate cyclase (AC), which catalyzes the conversion of ATP to cyclic AMP (cAMP). Accumulation of cAMP activates protein kinase A (PKA) by associating with its inactive precursor, R2Q, converting it to free regulatory subunit bound with cAMP (R2cAMP4) and active kinase (PKA). PKA phos-phorylates a presumed specific protein(s), which permits the transport of aquaporin proteins stored in particles (AQP) to the apical membrane, where aquaporin protein (Fig. 4-14B) inserts in the membrane to form a "water pore." This may be stabilized in tetrameric form. With an increase in water pores, more H20 is taken up by passive diffusion and presumably transported across the cell cytoplasm to the basolateral membrane in vesicles. These vesicles could also involve aquaporin proteins (see Fig. 4-14A). It is unknown whether VP has an effect on AQP mRN A. This is a highly speculative mechanism of enhanced water uptake from urine by the collecting duct cell under the stimulation of VP. TJ: tight junction. GTP accelerates the rate at which VP stimulates adenylate cyclase activity, and this mechanism is elaborated in Chapter 1. The availability of GTP or nucleoside triphosphates, such as ATP, acting similarly is important for the production of this effect in the cell. Under certain conditions, nucleoside trisphosphates can inhibit this process.